Once, Twice, Three Times a Variable Star! A page from Hevelius' 1690 Uranographia star atlas, which shows the then unknown variable, R Hya, to be a faint star in the tail of Hydra. Click on the above image for an enlarged view. Paris Observatory in the 17th century. The observatory, funded by King Louis XIV in 1667, is the oldest building designed by the architect Claude Perrault. The discovery of R Hya's variability has since been credited to Giacomo Maraldi in the year 1704. Maraldi, the nephew of Giovanni Domenico Cassini -- the first director of the Paris Observatory, known for many discoveries including the gap in the ring system of Saturn, which is known by his name -- was employed at his uncle's observatory. Working in the shadow of his famous relative, Maraldi became known in his own right for his valuable work in astronomy. Among his many achievements was his careful planetary observational work, with a focus on the planet of Mars. Based on his observations of Martian surface features, he derived a rotation period of 24h 39m, which is just two minutes of the now accepted value (Isles 1996). In addition, Maraldi actively observed comets and calculated various cometary orbits. He also recognized that the corona visible during solar eclipses belongs to the Sun rather than the Moon. In terms of variable star work, R Hya is his one and only claim to variable fame. AAVSO light curve of R Hya from 1906-2001. Click above image to enlarge. Mira variables are known to be cool red giant stars, found in the high luminosity portion of the asymptotic giant branch (AGB) of the H-R diagram. Such stars, in comparison with solar features, have larger radii, higher luminosities, lower temperatures, and lower surface gravities than our Sun. The change in magnitude, which can be by 2.5 or more magnitudes in the visual portion of the electromagnetic spectrum, is believed to be the result of pulsations. Mira stars are famous for their predictable (or semi-predictable), monoperiodic, large amplitude light curves. The periods of these stars are quite long, on the order of several hundred days, in comparison with other types of variable stars. Although the amplitude and shape of the light curves may stray slightly and period "jitter" of a few percent may be of the norm, the periods tend to be quite stable. R Hya, however, is an exception to the predictable rule. While R Hya is classified as a Mira-type variable star, it marches to the beat of a different drummer. Against the better judgment of its Mira family, the period of R Hya has shortened! The relation between period and semi-amplitude derived from post-1910 observations of R Hya (Zijlstra et al. 2002). Click on the above image for an enlarged view. R Hya is, in fact, known for its declining period. In the past few decades, the period of R Hya has declined by over a hundred days. More specifically, Zijlstra et al. (2002) found that the period was about 495 days around the year 1700, declined to 480 days by 1800, then to 450 days by 1850, 420 days in 1900, and finally to 380 days in 1950, where it has remained near constant since. (Actually, period jitter since 1950 is around 380-395 days, but is within the limit seen in Mira variables.) The decline, they found, is nearly linear with a rate of 0.58 days/year. The authors claim that extrapolating the data back to earlier dates suggests that the period shortening may have started around 1770, but admit that the condensed period may have started earlier with a slower rate of decline. In addition to the period shrinkage, the heights of maxima and depths of minima seen in R Hya have also changed considerably. Recorded maxima have been observed as bright as 3rd magnitude and as faint as 6th. Meanwhile the minima have been seen from 9th to 11th magnitude. Zijlstra et al. (2002) found that the semi-amplitude decreased from 2.2 mag to 1.7 mag between 1910 and 1950, then reached a minimum semi-amplitude around 1975, and has slowly increased ever since. The amplitude, it seems, is mimicking the period evolution. The interior view of a red giant. The red giant phase is one of the several evolutionary steps a star goes through throughout the course of its life, which, like all stages of stellar life, is the result of fusion processes. During this phase, helium burning in the core produces carbon and oxygen; hydrogen burning in the shell results in helium. The ultimate fate of the star, and the rate at which a star evolves, is greatly dependent on the mass of the star. Image credit: NASA's Observatorium. The century of steady decrease in R Hydrae's period is consistent with theoretical calculations of what should happen to a pulsating red giant after the sudden ignition of helium near its core. Mira stars are old and highly evolved, and their supplies of nuclear fuel are close to exhaustion. At the center of the star is a small but very dense core composed almost entirely of carbon and oxygen, the end products of helium fusion. 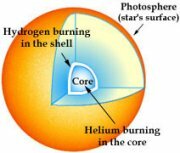 In a shell just outside this core, hydrogen is being converted to helium, so a thin layer of helium builds up on the core's surface. Every 1,000 to 10,000 years this helium shell should reach a critical mass and ignite, creating more carbon and oxygen. As soon as helium burning begins, the shell rapidly expands and the hydrogen burning above it turns off. For about a century the star derives its energy from helium fusion. When most of the helium is consumed the "shell flash" ends, the shell shrinks, and hydrogen burning resumes. A star may undergo several helium-shell flashes near the end of its time as a red giant. Eventually the star's outer layers will be expanded into space, and the carbon-oxygen core will shine as a white dwarf. Post-thermal-pulse evolution - Within this theory, the thermal pulse is believed to occur when a sufficient amount of helium has accumulated under the hydrogen burning layer. The result of the pulse would be a strong modulation of luminosity, which would peak over a time scale of about 10-100 years followed by a plateau, which would occur at the hydrogen burning luminosity on a shorter timescale. A decline in luminosity would ensue for a few hundred years. When the helium burning halts after about 1,000-10,000 years and the hydrogen layer begins to fuse for the next 10,0000-100,000 years, the star quickly recovers its pre-pulse luminosity. It is thought that the period and mass-loss rate would follow this luminosity evolution. The decline in luminosity would cause a reduction in stellar radius, which in turn, would cause the period to become shorter. It is thought that perhaps such a thermal pulse occurred shortly before the discovery of R Hya. Envelope relaxation - In this model, the evolution observed may be related to a change in stellar parameters. The period depends on the amplitude of pulsation, which may affect either the radius or the pulsation constant of the star. Mira pulsations are known to be intrinsically non-linear and it is this type of pulsation that leads to an internal relaxation of the stellar structure, and ultimately mass loss, which gives rise to a detached outer shell, or rings. Evidence for such loss is seen in the circumstellar rings that are observed around some AGB and post-AGB stars. Icke et al. (1992) found that there is a relation between Mira period and mass loss, in that the period instability increases as the envelope mass decreases. The result may be a change in the pulsation mode of the star. The trigger event for this mode-switching model may be due to weak chaos (see Icke et al. 1992), however, an exact model remains unclear. Whether the period decline is the result of a thermal pulse or envelope relaxation remains to be seen. Zijlistra et al. (2002) suggest that the concentric rings detected around some AGB and post-AGB stars may in fact be evidence of R Hya events. It is reported that the separation between the rings corresponds to a timescale of about 500 years. The thermal pulse, however, would yield one ring. The envelope relaxation, on the other hand, with a periodic trigger could produce the concentric rings. Further monitoring of this, and other Mira stars, will surely help to astronomers test and modify their astronomical models. R Hya resides near the imiginary constellation line dividing Hydra and Virgo. The corner of the extensive constellation of Hydra where R Hya resides can be found on the AAVSO Virgo-Corvus finder chart. R Hya is considered one of the many Mira variable stars easy to observe and with a mean visual magnitude range of 4.5 to 9.5, it makes for a great variable to monitor for those who use binoculars, small telescopes, and at maximum, even those with the unaided eye! According to AAVSO Bulletin 65: Predicted Dates of Maxima and Minima of Long Period Variables for 2002, R Hya is expected to reach maximum on July 27, 2002 and to fade to minimum on February 1, 2003. Observers armed with the AAVSO constellation finder chart and 'a' and 'b' scale charts for R Hya can contribute to the pool of over 14,800 observations already contained within the AAVSO International Database for the star alone! In addition to R Hya's variability, it is also known to be a visual double star. Its 12th magnitude companion, first mentioned by G.W. Hough in 1891, is located 21" northwest of the primary. The pair is believed to be a wide binary system with a very long orbital period (Burnham 1978; Isles 1996). Observers with binoculars and small telescopes should not expect to see R Hya's other half, but those with larger telescopes may be able to discern the pair. Felis the Cat is one of the many defunct constellations to be proposed throughout the years before the standardization of the 88 constellations by the International Astronomical Union. Created by French astronomer Lalande, the constellation contained stars between Antila, Hydra, and Pyxis. Lalande's justification for the constellation was, "I am very fond of cats. I will let this figure scratch on the chart. The starry sky has worried me quite enough in my life, so that now I can have my joke with it" (in Star-Names and Their Meanings by R.H. Allen). The constellation first appeared in the 1801 atlas of J.E. Bode, but the beloved domesticated pet has since been erased from the night skies. Although the owl-shaped constellation of Noctua has also been ousted from present-day constellations as well, other bird-shaped constellations remain. Observers interested in R Hya can find the variable about 12 degrees south of bright star alpha Vir, also known as Spica, and 2.6 degrees east of gamma Hya, located in what is known as the tail of the expanse water snake constellation of Hydra. Hydra, the largest constellation in the sky, actually used to be even larger, but was divided into four parts by cartographers such as Flamsteed and Hevelius. The result: Sextans, Crater, Corvus, and a reduced Hydra. At its reduced size, Hydra borders 13 other constellations, covering over 1,300 square degrees, or over 3% of the sky. Its great span is equivalent to 172 full moons side by side! The constellation is completely visible from latitudes +55 degrees to -83 degrees, while just portions are visible worldwide (Bakich 1995). Observers are encouraged to monitor R Hya, one of the 71 variable stars brighter than 5.5, in this grandiose constellation. Extra caution should be taken, however, when observing red stars, such as R Hya. It is known that red stars can appear to be brighter to the unaided eye when gazed upon for an extended period of time and also in conditions of bright moonlight (this is known as the Purkinje effect). Observers should plan to observe R Hya once a week throughout its entire cycle, while recording the decimal portion of the Julian Date to one decimal place. Observations may then be submitted to the AAVSO where they will be added to the 90+ year data archives! A wealth of Mira-related information may be found in the "Proceedings of the AAVSO Session on Mira Stars Commemorating the 400th Anniversary of the Discovery of Mira" published in the 1997 Journal of the AAVSO, Volume 25, Number 2. Allen, Richard Hinckley. Star Names: Their Lore and Meaning. New York: Dover, 1963. Bakich, Michael E. The Cambridge Guide to the Constellations. New York: Cambridge UP, 1995. Burnham, Robert, Jr. Burnham's Celestial Handbook (3 Volumes; R Hydrae in volume 3). New York: Dover, 1978. Hoffleit, Dorrit. "History of the Discovery of Mira Stars." Journal of the AAVSO, 25.2, 1997, 115-136. Icke, V., A. Frank, and A. Heske. "Weak Chaos in Long-Period Variables." Astronomy & Astrophysics, 258, 1992, 341-356. Isles, John E. "R Hydrae's Helium-Shell Flash." Sky & Telescope, May 1996, 68-70. Mattei, J.A. AAVSO Bulletin 65: Predicted Maxima and Minima for Long Period Variables for 2002, 2002. Zijlstra, Albert A., T.R. Bedding, and J.A. Mattei. "The Evolution of the Mira Variable R Hydrae." Monthly Notices of the Royal Astronomical Society, to be published in 2002.